Flyers of 12012, Clorcian(members from ClearVeil),Cu[be], Dali, カレン, KISAKI PROJECT, Mar’derayla, Megaromania, NEGA, Phantasmagoria, SIVA, VIDOLL and V.A. Trade card. Perfect condition. 2 euro. 肖像~in the cradle~ - full album. European release, with translation booklet. Very good condition. 16 euro. 飼い主は犬 – single. Very good condition, no obi. 6 euro. Burst Songs – mini-album, with trading message disk type E. Very good condition. 15 euro. Phantasmagoria ~~神創曲~Variant Jihad~ - maxi-single, with DVD. Perfect condition. 13 euro. Cheki - 1 Kiri, 1 Yuichi, 1 Cell. 5.50 Euro each. Syndrome ~~涙ノ下弦・・・ - maxi-single. Good condition, minor scratches. 8 euro. Nostalgia – maxi-single. Good condition, minor scratches. 8 euro. SEXUAL – single, tape. Good condition. RARE. 7 euro. Ken trade card. 3 euro. High Style Paradox III ~maiden voyage~ (UNDER CODE 2004 V.A.) 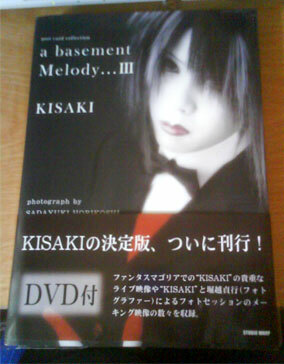 – 12 songs, includes VIDOLL, 12012, Karen, Ma’rderayla, Sugar Folkfull, HISKAREA, 妃＆関西貴族 songs. European release with translation booklet. Medium conditions, several scratches, but no problems with playing the CD. 10 euro. Matina 5th ANNIVERSARY 記念盤サンプル samples from 4 bands. Perfect condition. RARE. 7 euro. Yeah that's alright, I guess my paycheck will come by tomorrow or something but I can manage for now. I'll send you a pm with my paypal email. No problem! I'm going on holiday on the 23rd, but if we don't manage timewise before then, I'll be back 2 weeks later for a couple of days .w. Hi there :D Syndrome just the CDs and tapes, or with the trade card?XD; could do 63euro shipped (the Netherlands, right? ), since they're pretty heavy all together .w. But how much would you go for Variant Jihad and Eternal Silence + the entire Syndrome bunch together?